The term “bucket list” was popularized by the 2007 movie of that name. It’s an inventory of things people want to do before they “kick the bucket.” The idea is, since our time on earth is limited, if something is important for us to do, we have to do it now, because this is our only chance to do it. This makes sense from a naturalistic worldview, one which doesn’t recognize any afterlife. It also makes sense from various religious worldviews that maintain there may be existence after death, but without resurrection and physical properties, and with no continuity between this life and the next. The one worldview in which the bucket list makes no sense is biblical Christianity. This man loved Jesus, but did not want leave this world and become a ghost or an angel. As much as he loved Jesus, the Heaven he’d heard about seemed terribly boring and tedious. He’d heard that he should live now in light of eternity, but he thought eternity would mean the end of his opportunity to enjoy music and literature and adventure and travel and learning and discovery. So God would understand, he hoped, if he spent his time and money on his bucket list. After all, now was his only chance to experience happiness. Ironically, what he wished for is exactly what the Bible promises! We will live with Jesus in these bodies made new, and in a creation made new, without sin and suffering. Once he knew the true biblical story, the unfolding drama of redemption culminating in the resurrection of our bodies and our universe, he could at last realize there was no need for the bucket list. For the Christian, death is not the end of adventure, but our exit from a world where dreams and adventures shrink, and entrance into a world where dreams and adventures forever expand. 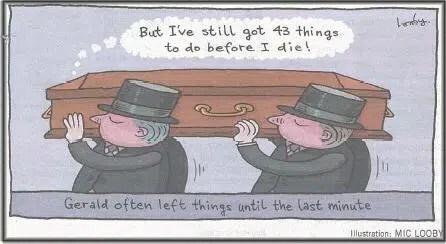 That’s why my wife and I like to talk about our post-bucket lists, consisting of all the things we look forward to doing after we die, and in particular, after the resurrection. We’re told there will be not only a New Earth, but a New Heavens (Revelation 21:1), the celestial heavens made new, presumably with new galaxies and stars and planets scattered across the New Universe. Remembering the Andromeda Galaxy I first marveled at through my telescope before coming to faith in Christ, I would love to journey there, to the New Andromeda Galaxy, to the praise and glory of King Jesus. My wife’s post-bucket list includes her dream to spend a lot of time by a lake, playing with dogs. Joni Eareckson Tada, once freed from her wheelchair, says she wants to run through flowered meadows. Since we’re told we will have physical resurrection bodies and we’ll be living on a physical earth, why not? The Bible doesn’t specifically tell us about dogs on the New Earth, but it tells us about other animals (Isaiah 65:17, 25) so why shouldn’t we expect dogs? It tells us we will eat and drink (requiring food and liquid), and walk and talk, so why not run through meadows? Or are you expecting an earth without grass and flowers? Perhaps an alarm is going off—“but that’s unspiritual—we should only want to be with Jesus.” Well, Jesus is right at the top of both of our post-bucket lists! Would the same God who says we should eat and drink to His glory (1 Corinthians 10:31) be offended if we want to play with His animals for His glory and travel to the stars for His glory? Of course, some of what’s on our post-bucket list may not be exactly as we envision it, but we know this for sure: God has revealed that we will be real people with real bodies living on a real earth with other real people and the real King of Kings— so anything there will be far more than we imagine, not less. I think God is honored when we let the imaginations He gave us soar as we move our eyes beyond this present fallen world, to anticipate the risen one— holy and happy beyond all comprehension— that the Carpenter from Nazareth has gone ahead to build for us (John 14:1-2). Lord Jesus, you told your disciples that you are preparing a place for us in your Father’s home for all who believe in you. Prepare us also, so that we may be with you in that wonderful place. Amen. 1) Blood is symbolic of death. We’ve all seen photos of car accidents or from battles or crimes, with bodies are on the ground, surrounded by blood. The life-blood has drained out. All that blood spilled often means death. Jesus wants us to remember that he died for us. His blood was shed for us. Blood is not a pleasant image. 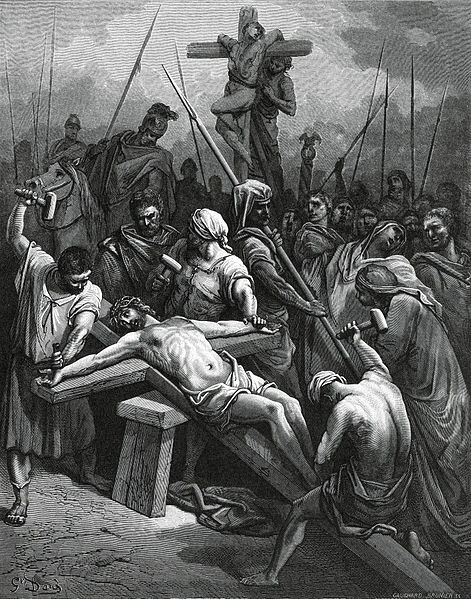 Crucifixion was not an easy way to die. It was painful, it was slow, and it was bloody. Every time you receive communion, you hear about it. “The blood of Christ, shed for you.” Jesus wants you to keep that image in your mind and remember it. 2) Blood is a symbol of life. 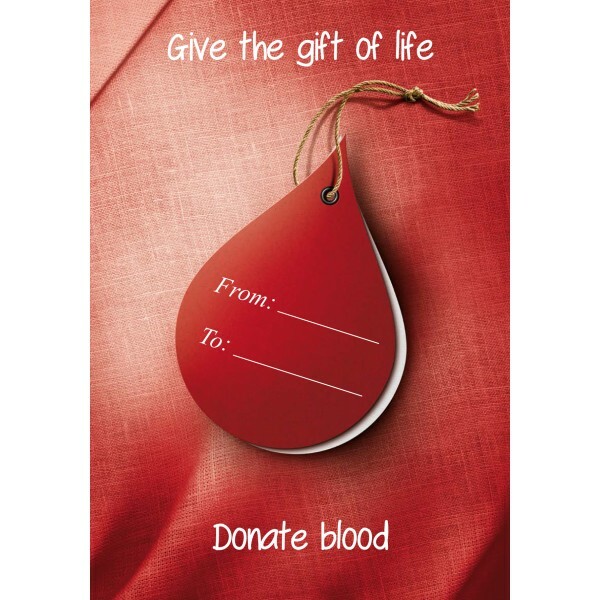 ‘Give blood and give the gift of LIFE,” we are told when the bloodmobile comes to town. The Red Cross organization exists to save lives, and the cross is RED, like blood. Jesus died, and Jesus rose again, and he said, ‘Because I live, you shall live also.” “The blood of Christ, shed for you;” so that YOU can live again. 3) The verse I began with talked about robes being washed in the blood of the lamb. Blood will never work as a fabric cleaner, but it is, in fact, the very most important cleaner. Every red blood cell going through your body is always doing two things. On the way out from the heart and lungs, it is delivering life to every part of the body, life in the form of oxygen and nutrients. On the way back, it cleanses the body, taking back deadly carbon dioxide and whatever else the cells of the body need to discard. The blood brings life, and then, it cleanses the body. The death of Jesus on the cross wins for us eternal life, because he cleanses us from our sins. We could not live ten minutes if our blood was not cleansing us. We could not live eternally unless cleansed from our sins and forgiven. The blood of Christ cleanses us. It is not only a striking symbol, but an accurate one of what blood really does. Hebrews 9:22 — In fact, the law requires that nearly everything be cleansed with blood, and without the shedding of blood there is no forgiveness. I Corinthians 11:23-26 — For I received from the Lord what I also passed on to you: The Lord Jesus, on the night he was betrayed, took bread, and when he had given thanks, he broke it and said, “This is my body, which is for you; do this in remembrance of me.” In the same way, after supper he took the cup, saying, “This cup is the new covenant in my blood; do this, whenever you drink it, in remembrance of me.” For whenever you eat this bread and drink this cup, you proclaim the Lord’s death until he comes. There are many strange verses in the Bible. Some of them, after a little thought and study, and perhaps a little more maturity in the faith, become not strange, but wonderful and meaningful and true. It is like some of the things that your parents told you when you were young. At the time, you thought you knew better, and you were sure that whatever they told was wrong or outdated. But then, after a few years of being out on your own, you began to see the wisdom of their words and their ways, and before long, you were saying the same thing to your own children. When it comes to the Bible, we all have a lot of growing up to do, no matter what age we are. So if something looks strange to us, we ought to be willing to approach it with humility. We may well remember that we are children before God, and may not yet know everything. There are, however, some verses that seem strange the first time, and just as strange, the fiftieth time you read them. For example, consider Revelation 7:14. If you want to find strange verses, Revelation is a good place to go, and this verse is as strange as any. John is seeing a vision of the great multitudes of those who have been saved and are with the Lord in heaven. One of the elders says of this great multitude of the saved, “These are they who have come out of the great tribulation.” The great tribulation must be life on this earth, so that part is easy enough to relate to. But then it says, “They have washed their robes and made them white in the blood of the Lamb.” What does that mean? If you were going to wash something and try to make it white, would you wash it in blood? Blood stains everything. Blood would never work as a fabric whitener. But, of course, this is not a lesson in washing clothes. Rather, it is symbolic language, symbolizing how we have been washed clean from all our sins by the blood of Jesus Christ shed for us on the cross. That is true and it does help to move this into the realm of the symbolic. But even at that, this is a difficult symbol. When you receive communion the minister gives you a little sip of wine and says, “The blood of Christ, shed for you,” and then you drink it. You have probably been around church long enough to know something of what that is all about, and so you see nothing strange in it. But imagine someone coming in off the street, having never been to a Christian church, and they hear this talk of drinking blood. They probably would not catch on right away, and it would be a tough symbol to explain in even an hour. It’s a wonderful symbol, but it is not an easy symbol. As I said, understanding some of what is in the Bible takes a bit of time and knowledge and maturity in the faith. The other day a little girl from Sunday School had a question for me. She could not understand all this business about God as our Father. She already had a father. He tucks her into bed at night, but then they say a prayer to another father. What does that mean?, she wondered. Well, I gave my best explanation for someone that age, and she listened politely. I then asked her if that helped. In a clearly disappointed voice, she said with a sigh, “A little.” And Father is an easy symbol compared to blood. There is much in the Bible about blood– from the shedding of the blood of the Passover lamb, to Old Testament altars drenched in blood, to Jesus on the night before his death talking about the new covenant in his blood. It is indeed a difficult symbol, but one has to admit, it is a striking and memorable symbol. And one of the purposes of communion is to help us remember. Many years ago I read a book called The Memory Book. One of the keys to memory, it said, was to create pictures in your mind of what you want to remember; and the more bizarre the picture, the better and more effective. For example, if you meet a man named Phil MacDonald, and you want to remember his name, picture Phil in bib overalls and a straw hat, standing in a cornfield. Imagine him with his pockets filled (as in ‘Phil‘) with chickens and little pigs, and they are all singing, Old MacDonald Had a Farm. Having that outrageous picture in your mind with help you remember Phil MacDonald’s name. I John 1:7 — But if we walk in the light, as he is in the light, we have fellowship with one another, and the blood of Jesus, his Son, purifies us from all sin. Ephesians 2:13 — But now in Christ Jesus you who once were far away have been brought near by the blood of Christ. The United States has been and still is a nation of immigrants, and millions of these new arrivals want to learn the language of their new country. Thus, there is a great need for ESL (English as a Second Language) teachers and volunteers. I have heard that ESL volunteers are told in training that when someone learns a new language, each WORD must be repeated a minimum of 50-60 times before it is implanted in the brain. To teach someone a new language is a long and laborious process, requiring great patience. Think of it, between 50 and 60 times of saying or hearing each word before it is in the mind for good! And think of how many words it takes to build even one sentence; one sentence so someone can then, finally, make a comment on the weather, communicate a thought, or ask directions. A child growing up learns the language of their parents quickly, but this is hard work for an adult. A great deal of effort is necessary to find one’s way in not only the language, but also in the whole culture of a new and different country. Much knowledge is needed to find our way around in this mortal, earthly realm. So what effort, we might ask, is needed to learn things in the realm of the spirit, things necessary to find our way to and in that heavenly realm? How much repetition would be needed to learn the language of faith, the language of trust in God and obedience to God? Jesus touched on this a little bit in a discussion one time with his disciples. “Seventy times seven” he said, “you must forgive your brother.” 70 x 7. The disciples had asked if three times might be enough, but Jesus said, “Oh no, it is going to take a lot more practice than that!” It is by repetition that we learn the language we speak, and it is by repetition that we learn the language of faith. There are a few other times when such numbers are mentioned in the Bible in connection with growing in faith. In the Old Testament, God made the ancient Israelites wander in the wilderness for forty years before they could enter the promised land– forty years for them to learn to trust and obey their God. Forty days Moses spent on the mountaintop, praying and preparing to receive the Ten Commandments. Jesus himself was led into the desert to be tested for forty days. And the Season of Lent is forty days in the church year to remember again the story of Christ’s sufferings and death for you; a time to hear again the same story, hear the same Gospel preached, receive the same sacrament of the bread and wine, the sign and seal of his promise of the forgiveness of sins, life, and salvation for you. Think of all the many Sundays you have gone to church over the years, going through the same order of service again and again; to confess your sins again, to hear that word of forgiveness again, to say the Creed and the Lord’s prayer again, to hear those same Scripture lessons read again, and to hear yet another sermon. So much effort just to learn the language of the spirit, as we stumble and mumble along in our clumsy way on the path to God. But this is an effort we must make, and must continue to make. That is, unless you already have this all firmly planted in your mind, heart, and soul. But do you? Is there ever a week that you do not have any sins to confess? Do you already know all there is to know from the Scriptures? Is your faith is so strong that you do not need the weekly reminders and encouragements and presence of the Holy Spirit? You won’t need to answer that. God has already answered it for you. He made it clear in his commandments when he said, Remember the Sabbath Day to Keep it Holy. Remember by repetition, by observing the Sabbath every week. It takes great effort to learn another language so that it is firmly implanted in the mind– 50-60 repetitions for each word. How can we expect that the language of faith, this language of an entirely different realm, should be easy or come automatically? Given the choice, I would never have learned any other languages. English would have been enough for me. But my educational goals forced me to learn three languages. I needed two years of a foreign language to help me get into college, so I studied French in high school. I then needed two years of a foreign language to get my Bachelor’s degree, so I studied German in college. I needed three semesters of ancient Greek to graduate from seminary, and so I studied Greek. After six years of such study I can assure you, repetition works in learning a language. It is the only thing that works. And repetition takes time. The more time I spent, the better grades I received. When I spent the time studying, I would get A’s– always in German, and usually in Greek. When I did not spend the time, I failed, as I did one semester in Greek when I took too many classes and worked too many hours at my job. I did not take the time for the repetition. Repetition is the key to learning and maintaining the knowledge of a language. The language I learned best was German. After two years, I was able to carry on a simple conversation. But then I never used the German that I learned, and within a few years lost almost everything. The language of faith also needs repetition, or faith can be lost. So, “On the night in which he was betrayed, our Lord Jesus took bread and gave thanks, broke it and gave it to his disciples saying, take and eat, this is my body given for you. Do this in remembrance of me.” Keep doing this, Jesus said, keep repeating this ritual; because it will help you remember me, it will help you remember what I did for you. It will, we might say, help us learn and remember the language and the ways of that spiritual realm, that heavenly world in which we will one day be newly arrived immigrants. Our liturgical tradition, so often condemned as the ‘same old thing’ week after week, is built on this principle that we learn by repetition. It sounds like work, but it is all grace; because what we keep hearing over and over again in that liturgy is the truth about ourselves– that we are weak and fragile– and that we need to come back time after time to find our refuge and strength. The truth is that we will never finally grasp it, never get completely rid of the sin, never really get it all together. God knows that. But still we are invited back to hear again and again God’s word of forgiveness and his promise of eternal life, won for us by the death and resurrection of his Son Jesus Christ. We are reminded that ‘we are weak and he is strong’ (as we learned in Sunday School), and that we have all fallen short, but that God in Christ has saved us. So yes, God does insists that we come back, every Sabbath, but only so we don’t forget and turn away; so that we will keep the faith and do not become lost as we emigrate to that heavenly land. Grant, O Lord, that the words we have said with our lips we may believe in our hearts and show in our lives, to your honor and glory; through Jesus Christ our Lord. Amen. (…continued) ‘By Faith,’ is a phrase the Bible often uses. An often quoted definition of faith is to “Let go and let God.” Let go of your fears and your anxieties and have the faith to let God take care of you. It has a nice ring to it, but I was never totally sold on it myself. Let go and let God do what?-– pay my bills, get the transmission fixed on my car, and mow my lawn when I don’t have time. I don’t think it will work to let go and let God do any of that. So let go and let God do what? That line certainly does not apply to everything. I still have to pay my bills, make an appointment to get the car fixed, and find time to mow my lawn. But those are the little things in life, and God has given me the strength and the ability to work through that sort of a to-do list all by myself. But there are other things, bigger things, that do not fit on any to-do list that we are able handle. Where do I go with my feelings of guilt? What can I do about my frustration with how fast the years are flying by? What about the sadness of seeing loved ones dying all around me? I’ll never get around to fixing those things, because I do not have the strength or the ability or the resources to do so. It is in these deeper, larger aspects of life that we must ‘Let go and let God.’ Let go and let God carry you through; now and on into the life to come. That is indeed a wonderful illustration for what it is like to live by faith. We need faith to face those big things in life, but still we say, “What if none of this is true? I can’t see God, what if it is just us here on this little earth? I am so afraid of death.” So we desperately cling to this life, trying to have it all and do it all here, right now, nervously watching the years slip away on us. 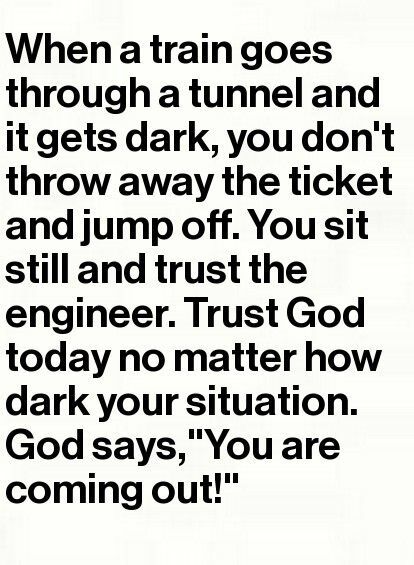 But God is saying, “Just let go. Take my hand and let me lead you. Surrender your fears to faith in me, and really let go, you will be fine…” Let go and let God forgive you. Let go and let God give you an inner peace even amidst all of life’s outward troubles. Let go of your fear of death, and let God’s promises give you comfort and hope. Yes indeed, live to the fullest every day that God gives you now, but be ready when the time comes to let go and trust God that he will make good on his promises for eternal life. 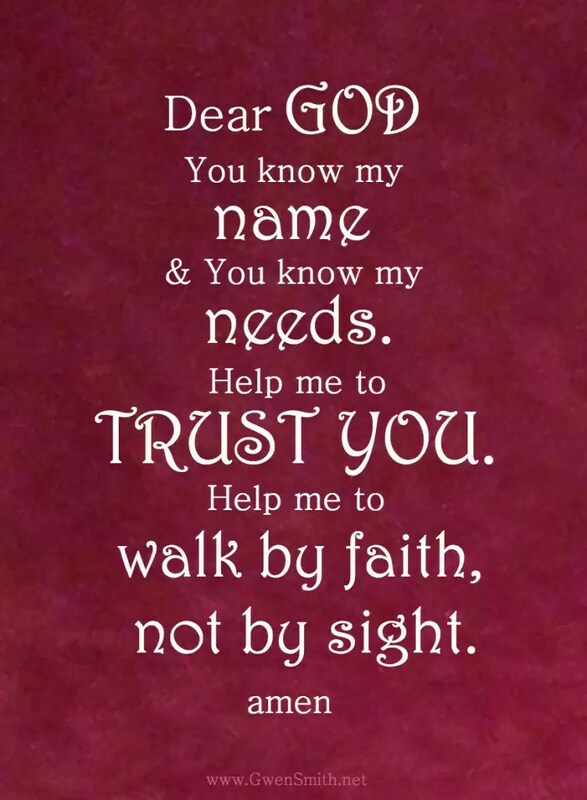 “We walk by faith, not by sight,” says Paul in II Corinthians 5:7, and isn’t that the truth? Each week I lead worship, talking about and saying prayers to a God I cannot see, but believe in by faith. There are many good and logical and historical reasons for believing in the God of the Bible, but there is no absolute proof. Ever since Adam and Eve were cast out of the Garden of Eden, God has hidden himself from our eyes, and now, faith is what we have to depend on. Therefore, the Bible is big on faith, as you might well imagine. Its pages are filled with the stories of faithful people, with commands to have faith, and with encouragements to that life of faith. Nowhere is this more evident than in Hebrews chapter eleven. This chapter has been called Faith’s Hall of Fame because it recalls many of the Old Testament heroes, and lists the many things they were able to accomplish by faith. The chapter describes the great faith of Noah, Isaac, Jacob, Joseph, Moses, Rahab, Gideon, Samson, David, Samuel, and more. “We walk BY FAITH,” said Paul in the verse I began with, and that phrase BY FAITH, is repeated 22 times in this one chapter. By faith Noah built the ark, by faith Abraham and Sarah were enabled to become parents in their old age, by faith Moses parted the Red Sea, by faith the walls of Jericho fell; and so on. And, by faith we go to church on Sunday morning to worship a God we do not yet see, believing in a promise of eternal life which we cannot yet confirm. We do indeed walk by faith and not by sight. And many folks will have none of that. ‘Seeing is believing’ would be their motto and if it cannot be seen, it will not be believed. They want to live their lives by the facts, and by what they can confirm on their own; so there will be no wishful thinking or faith in the unseen or the uncertain for them. But like it or not, we all live much of our lives by faith. We have no choice. Even the most convinced atheist is walking by faith and not by sight a good share of the time. I will tell you what I mean by using that often used Biblical phrase ‘by faith’ in a slightly different context. “By faith we drive our cars onto and over highway bridges.” True or false? Of course that is true, and no one in Minnesota is going to argue that point. We all well remember the special news report on August 1, 2007, when we learned that the Highway 35W bridge over the Minnesota River in Minneapolis had collapsed. Thirteen people were killed and 145 were injured– and everyone gave some thought to what it means to have confidence in the people who make and maintain the bridges that we cross. Think about it. Every time you cross a bridge you are putting your faith in the designer that drew up the plans for that bridge, the construction company that built it, the inspectors that evaluate its condition, and the politicians that vote for or against funding to keep those bridges in good repair. Paraphrasing Paul we might say, ‘we walk, and drive, by faith, and not only by sight.’ You can’t go very far without having to cross a bridge. When you get to a bridge, do you always get out and check it over first, before you drive out onto it? Or, do you trust that others have done so and put your faith in them? Even if you don’t have to cross any bridges, you still need a lot of faith if you want to go anywhere in your car. By faith, you will need to trust that every driver you meet will stay on his or her side of the road. Drivers don’t always do that, and there is no way to check out ahead of time who you will be meeting and if they are sober, healthy, and not distracted by their cell phone. Bridge or no bridge, you never know for sure when you get in your car to go anywhere if you will ever reach your destination. You have to have faith in the driving skills of many people that you do not even know. This is only one of countless examples. Did you ever go to the doctor, have surgery, eat in a restaurant, ride in an elevator, listen to the weather report of storm warnings, call an ambulance, fly in an airplane, or go on a carnival ride? Are you getting the picture? We are walking by faith, and not by sight, all the time. Yet, doctors make mistakes, people sometimes get sick in restaurants, weather reports can be wrong, planes crash, and roller coasters occasionally have problems. So what do you do? Do you stay home and not make a move? Or, do you keep going, living each day ‘by faith and not by sight.’ Every day we get a lot of practice in living by faith. You cannot live without faith. This is not exactly the same kind of faith as the faith in God that is described in the Bible, but this does illustrate how it works. When you cross a bridge, you are putting your life in the hands of others. You are trusting in them and the quality of their work for your safety. And when you must cross over from life into death, you are placing any future life you might have in the hands of God. In our lives right now, we have had plenty of experience in trusting God. It was God who gave us this life in the first place, and God who sustains this life with the miraculous workings of our bodies, and, with the miracle of growth of our food in the fields by the sun and the rain; all of which is out of our hands. And faith in God is not limited to our lives here, but contains promises that go beyond death. There is a big and uncertain bridge between here and whatever comes after death, and none of us have ever been on that bridge before; so we must venture out on by faith. Hebrews 11:1 — Now faith is confidence in what we hope for and assurance about what we do not see. Ephesians 2:8-9 — For it is by grace you have been saved, through faith— and this is not from yourselves, it is the gift of God— not by works, so that no one can boast. And your sea is so big. From childhood I’ve loved astronomy. Night after night I would gaze at the stars, clueless about a Creator, but longing for something more. I yearned for something bigger than myself. One night I discovered the great galaxy of Andromeda, with its trillion stars, 2.5 million light years away. I was filled with awe. I longed to go there and explore its wonders, and lose myself in something greater than I was. One night several years later, I opened a Bible and saw these words for the first time: “In the beginning God created the heavens and the earth.” And then I read verse 16, the greatest understatement ever: “He made the stars also.” A universe one hundred billion light years across, containing countless trillions of stars, and the Bible makes them sound like a casual add-on! Genesis 1:16 — God made two great lights—the greater light to govern the day and the lesser light to govern the night. He also made the stars. Psalm 147:3-5 — He heals the brokenhearted and binds up their wounds. He determines the number of the stars and calls them each by name. Great is our Lord and mighty in power; his understanding has no limit. Isaiah 51:6 — Lift up your eyes to the heavens, look at the earth beneath; the heavens will vanish like smoke, the earth will wear out like a garment and its inhabitants die like flies. But my salvation will last forever, my righteousness will never fail. Father Rick Frechette is a Roman Catholic priest who has given his life to serving among the poorest of the poor in Haiti. He has been there for over 30 years, and has loved his ministry with the Haitian people. They have such miserable lives, he says, but are always so cheerful, so filled with gratitude, and many of them have a strong faith despite their desperate circumstances. He describes it as a wonderful blessing to serve among them. In 2010 there was an earthquake in Haiti that killed somewhere between 150-250,000 people, destroying much of the capital city of Port-au-Prince. Bodies were piled high in the streets, the smell of death was everywhere, everything was in ruins, and there were few places for the injured and homeless to go for refuge. For a long time after that, it was not so wonderful for Father Rick to be there. For months, it was just day to day misery. It was Father Rick’s duty to stay, and he stayed. He loved those people, he knew how to help them, and he worked through that tragedy with them. But the days were filled with grief, mental distress, physical exhaustion, and spiritual agony. You may remember the truckloads of bodies that were carried out of the city to the mass graves. For days, Father Rick made it a point to be at many such burials, seeing to it that those dead, so hastily buried, could at least have the dignity of God’s Word read over them as they were laid to rest. Sometimes there were family members present. Other times, dozens of unknown bodies were being buried even as loved ones in other parts of the city were looking all over, hoping to find alive the very ones who were being buried there anonymously. It was a tragedy beyond comprehension. This is a simple blessing, said in haste, but filled with the truth of the Christian hope. It is a hopeful, even pleasant word, spoken in the very pit of that hell-on-earth. May the angels lead you far, far from here, he said, speaking to those corpses as though there was something left, someone there yet. And he would tell them that there was someone coming for them. He would tell them that they were going somewhere else, far away from that hell-hole. And he was able to speak like that only because Jesus had spoken of that other place, Jesus who rose from the dead to show us it can be done. And then Jesus said that we too may live again. Without Jesus, all that was left of those lives was a warehouse full of rotting flesh. But because of Jesus, Father Rick could make that outrageous claim that all who believed in him were on their way to somewhere else. Only because of Jesus’ death and resurrection is such a blessing possible. The resurrection of Jesus answers the larger question of death itself that underlies not only disasters like the Haiti earthquake, but all of life. You see, the tragedy in Haiti was that so many died all at once. But in the long run, all of those people would have died anyway, as will each of us, and then we will be no more or less dead, no more or less without hope, than any one of those hundreds of thousands buried in mass graves by the truckload. Two hundred thousand all at once, or, one at a time, either way, the same fate still awaits us all. And then our only hope, like theirs, is that, as Father Rick said in the blessing, there will be someplace else to go; someplace far, far from here. It is that certainty, that blessing, that eternal hope and promise, that is the central message, meaning, and purpose of the Gospel. Christ died so that we might be forgiven, and Christ rose from the dead, so that we too might rise. Anything else we might pray for or hope for from God is only a far distant second best by comparison. In the meantime, there will be many things that we too must suffer, and we may not see any purpose in such suffering. But our vision is limited. God is a big God, and his creation is a big creation, and eternity is a long time, and we see such a small part of any of it. C. S. Lewis (left) with Paddy Moore (right) in World War I, 1917. Our state is thus: my ‘mother’ has had to retire permanently into a Nursing Home. She is in no pain but her mind has almost completely gone. What traces of it remain seem gentler and more placid than I have known it for years. Her appetite is, oddly, enormous. I visit her, normally, every day, and am divided between a (rational?) feeling that this process of gradual withdrawal is merciful and even beautiful, and a quite different feeling (it comes out in my dreams) of horror. There is no denying that our domestic life is both more physically comfortable and more psychologically harmonious for her absence. The expense is of course very severe and I have worries about that. But it would be very dangerous to have no worries– or rather no occasions of worry. I have been feeling that very much lately: that cheerful insecurity is what our Lord asks of us. Thus one comes, late and surprised, to the simplest and earliest Christian lessons!
. . . I am glad to hear your inner news. Mine, too, is I think (but who am I to judge?) fairly good. Let us pray for each other. Psalm 73:26 — My flesh and my heart may fail, but God is the strength of my heart and my portion for ever. Psalm 56:3 — When I am afraid, I put my trust in thee. Lamentation 3:25-26 — The Lord is good to those whose hope is in him, to the one who seeks him; it is good to wait quietly for the salvation of the Lord. Proverbs 17:22 — A cheerful heart is good medicine, but a crushed spirit dries up the bones. We can become very good at excusing our own wrongdoing. “I couldn’t help it, I was up against it, I was afraid, I didn’t have time to think, I was having a bad day, and shucks, I’m only human, can’t you give me a break, nobody’s perfect, you know,” and so on. But are we as quick to make allowances for those that hurt us? Do we stop to think what might have been going on in their mind? We are far quicker to understand and excuse our own behavior than the behavior of others. Frank McCourt’s brilliant idea for that English assignment helped those kids learn about writing, and the same exercise can help us in our life of faith. Think of someone who has wronged you. Then think about what you would say if you had to write their excuse note. The old Indian proverb says, “Don’t judge another until you have walked a mile in his moccasins.” It would be good to at least imagine what the other person was thinking. It might surprise you to see that you may begin to understand why they did why they did. This is not to excuse the wrongdoing. There are all sorts of things people do that there is no excuse for and it is just plain wrong. That’s what sin is– a wrong done against someone else, and against God. But making the same allowances for others as you make for yourself, might help you be more willing to forgive them. To forgive someone is not to say it doesn’t matter. If it doesn’t matter, it doesn’t need to be forgiven. But to begin to see that person as a sinner, like yourself, you who have also done wrong, is to take a big step toward forgiveness and reconciliation. When we read the Bible, it becomes clear that God is serious about sin and disobedience. But God is also serious about forgiveness and mercy. Colossians 3:13 says, “Bear with each other and forgive whatever grievances you may have against one another. Forgive as the Lord forgave you.” God’s rules are not made to be broken, they are made to be kept. But God has another rule for when rules are broken, and that rule is this: ‘Forgive as the Lord forgave you.’ Don’t miss the promise that is contained there; AS THE LORD FORGAVE YOU, it says. God doesn’t want our excuses. God wants our repentance, and our determination to change our behavior and obey Him. And God wants us to know we are forgiven. Jesus died on the cross so we may know that, be comforted by that, and then, be willing to forgive others. Romans 2:1-4 — You, therefore, have no excuse, you who pass judgment on someone else, for at whatever point you judge another, you are condemning yourself, because you who pass judgment do the same things. Now we know that God’s judgment against those who do such things is based on truth. So when you, a mere human being, pass judgment on them and yet do the same things, do you think you will escape God’s judgment? Or do you show contempt for the riches of his kindness, forbearance and patience, not realizing that God’s kindness is intended to lead you to repentance?